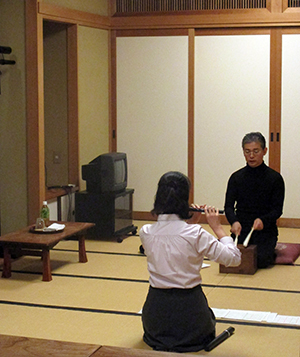 You can book our facilities for recitals and practice of Noh, Kyogen and other Japanese traditional performing arts. For the first time, please contact us. Fees for incidental equipment shall be paid on the day of hiring. Visit us and complete your application procedure by filling the application form and paying the fees within a month after booking. In case the application form is not submitted or the fee is not paid after a month from booking, your booking will be automatically cancelled. *If you use Main Stage or Second Stage and other facilities, you can apply for all venues at one time. *Some applications may not be accepted due to the purpose of hiring. *Hours of venue hiring include preparation and clearing up. *Charges for Main Stage include charges for dressing rooms. *In case of extending the time of use, extra charges written in ( ) brackets in each category on the table above shall be paid. *In case of cancellation after application, fees are not refunded basically.